I acknowledge there is no guarantee of live delivery on bird orders and agree with ALL the Terms and Conditions set forth within the corresponding tab below. Our Chukar adult flight birds are a must-have for training your bird dog. 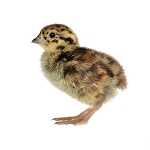 After being raised in our 50' x 500' flight pens, these birds will fly as if they were raised in the wild. Chukar Partridge is also known as 'Indian Chukar', 'Red-legged Partridge', 'Rock Partridge', 'Indian Hill Partridge', 'Chukka', 'Chukkar', 'Chukor', 'Chukore', 'Chikone', 'Kabk', 'Kau-Kau', and 'Keklik'. The bird is mostly gray in color, with shades of brown in the tail and secondary wing feathers. It has a white face and red-colored legs. The bird can be easily identified with a black band running down to below the neck from the eyes, which gives the impression of a necklace. 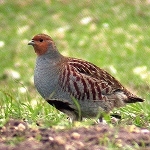 Both the male and female Chukars are strikingly similar in appearance; only the females are slightly smaller than the males and have a smaller spur. These birds make a very loud and peculiar sound. Chukars are one of the most commonly kept and bred of all game birds and thousands of Chukars are produced each year for hunting preserves and release. 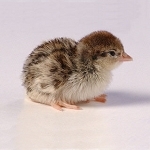 Chukars are also known as great birds for beginners, being very easy to keep and breed in captivity. Chukars are very hardy and can withstand both extremes of temperatures. During the Winter, keep as many birds as you can together so they can covey for warmth. September through February or until sold out. NOTE!! These birds will start shipping in September as they become available and until they are sold out. 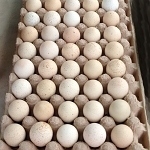 They will be shipped from one of our game bird farms located on the East Coast. We will fulfill orders in the sequence they are received until sold out. ALL PRICES INCLUDE USPS EXPRESS MAIL SHIPPING. USPS cannot guarantee overnight delivery to all destinations due to airport locations and flight schedules. Depending on your delivery destination Express Mail delivery times are within 24-48 hours. We do not ship on the weekends, shipments are made Monday - Thursday so deliveries can be made Tuesday - Saturday. Shipment may be delayed due to weather conditions. We CANNOT GUARANTEE LIVE DELIVERY! 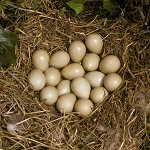 Once live birds are handed to the US Postal Service for transport and delivery, their care is out of our hands and thus all associated risks must be acknowledged and accepted by the customer before an order can be fulfilled. Refunds will not be provided for DOA shipments, you must file a claim with the US Postal Service.